Hindustani Gharanas: Gharanas means Ghar or house. It is a place for learning music from different schools. These schools have their own mode of teaching and each school has its own rules. The teaching and even the performance of each school differ. The singers take the pride of saying to which school they belong to. A gharana can take the name of a place, person. Any place where a student is learning cannot get its name. To get the name of gharana there must atleast be three generations of established relation between teacher and student. With the rise of gharanas different style of Ragas also emerged. Let us try to understand different gharanas in brief. The five major khyal gharanas that are present now are Gwalior gharana, Agra gharana, Jaipur-Atrauli gharana, Patiala gharana and Kirana gharana. Gharanas from Dhrupad are Mathura, Jaipur, Varanasi and Dharbhanga and gharanas from thumri are Benaras, Patiala and Lucknow. Gwalior Gharana: This is the oldest gharana of Kyal gharana. This gharana came into existence during the period of Mughal empire. This gharana is known for its simplicity in ragas. There is limited raga expansion in khyal gharana. There is full melody in the song and no slow tempo. Bhandish is very important during performance. Famous founding artists are Haasu Khan, Nathu khan, Haddu Khan. And some famous exponents are Omkarnath Thakur, Veena Sahasrabuddhe and Malini Rajurkar. Agra Gharana: Agra Gharana dates back to 1300 AD during the period of Aladdin Khiliji. The history of this gharana is still a mystery and no body knows much about it. The first musician was Nayak Gopal. The singers of Agra gharana are blend of both Khayal and drupad-Dhamar. During the training in agra gharana both the components of Drupad and khyal are taught. Always the performers start with nom tom alaap. Some famous exponents of this gharana are Faiz Khan, Khadim Hussain Khan, Vilayat Hussain Khan and many more. Jaipur Atrauli Gharana: It is also known as Jaipur gharana was founded by Alladiya Khan during late 19th century. They migrated to jaipur from Atralui before giving this name to gharana. One of the important features of this gharana is strong hold on Jod ragas. Usulaay the singers sing one rag in Aroha and the other in avaroha. But the singers of Jaipur Atrauli mix both the ragas and sing. The listeners get to hear the amalgamation of both ragas. Some famous exponents of this gharana are Ashwini Bhide Deshpande, Mallikarjun Mansur and many more. Patiala Gharana: This gharana was founded by Ustad Fateh Ali Khan and Ustad Ali Baksh Khan. Ekthaal, teenthal are the most common usage in this gharana. The most exquistive feature of Patiala gharana is equal importance is given to both swara and laya. It has most fluent and appealing style of singing. 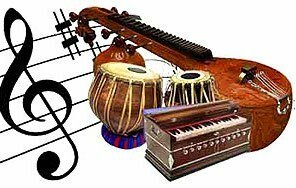 Some famous exponents of this gharanas are Bade Ghulam Ali Khan, Shiv Dayal Batish, Bade Fateh Ali Khan, Ali Baksh Khan and many more. Kirana Gharana: The name of this gharana is derived from Kairana a small town in Uttar Pradesh. It is the birth place of Abdul Karim Khan. He is the famous exponent of kirana gharana. He was influenced by Carnatic music who used to frequently visit Court of Mysore. Hence most of the exponents of Karnataka belong to Kirana Gharana. The central part of this gharana is swara. Some of the prominent exponents are Abdul Karim Khan, Bhimsen Joshi, Prabha Atre and many more. Indore Gharana: Another important Gharana of vocal music. The founder of this gharana is Amir Khan who grew up in Indore. Some of the important features of this gharana are slow development of raga. Emphasis is given melody. It also has mixture of taan types in a single taan. Some prominent exponents of this gharana are Pandit Amarnath, Kankana Banerjee, Shanti Sharma and many more.